Invite your child’s friends over to your Power Ranger birthday party. This theme proves to be a hit with those kids who love “out-of-this-world” battles and mystique powers. Make your Power Ranger party invitations using regular white invitation cards. Download a picture of Power Rangers and print it on the front. Decorate the cards with theme stickers, and then write your party details inside. Provide some information as to what the kids will be doing and include one or two menu items. As a variation, you can get Power Rangers activity book and have your child color the pages. Next, take pages out, fold them in half – and you have invitation cards. Write Power Ranger birthday party details in blank space. Place the invitations in envelopes and mail to the guests. Use as much red, blue, green, yellow, and pink for your Power Rangers birthday party decorations as you can. Take a picture of your child wearing a Power Ranger mask (or full costume). Then enlarge the picture and mount it on the fence to mark your Power Rangers party spot! Play theme music in the background. Draw and cut out shapes of Power Ranger S.P.D. badges, blasters and swords. Spread out cutouts all over the driveway to help lead your guests to the front door. Attach colorful steamers to a light fixture in the center of the party room to add to the festive environment. Multicolor streamers can easily be created by placing two different colored streamers back-to-back and twisting. Mount Power Ranger posters on the walls. Spread out theme items around the area. Print battle scenes between Power Rangers and Villains. Use signs over the pictures of Rangers to display their mystic power. For example, for Red Ranger write “He can control fire and heat”, for Green Ranger – “He has control over nature and plants”, etc. Include pictures of Power Ranger weapon arsenal such as laser guns and swords. *Coloring Books: As the kids arrive, provide them with crayons, markers as well as theme coloring pages. Then invite them to color those pages while they are waiting for other guests to arrive. *Power Rangers Mural: Before the Power Ranger birthday party, tape a wide sheet of butcher paper to the lower portion of the wall. Hand out paints and markers, and have your little artists paint their masterpieces. Provide them with pictures of Power Ranger characters for inspiration. Include such Power Rangers party favors as theme whistles, masks, laser spinners, glow sticks, flashing bouncy balls, ‘lighting bolt’ removable tattoos, glow necklaces and Power Rangers sticker sheets. *Power Rangers Message Challenge: Invite the guests to sit in a circle. The Power Rangers must accurately pass a message from one person to the next. The birthday child thinks of a message and whispers the message to the child on his or her left. The message gets whispered around the circle. When the message has traveled around the circle, the child on the birthday child’s right announces the message out loud. Then the birthday child announces the original message. Watch the kids giggle as they compare the two. Continue the game with other players coming up with messages. *Ranger Relay Try-Outs: Before your Power Ranger birthday party, cut our four large foot-shaped pieces (about 12″x15″) from green cardboard or sturdy paper. Divide the kids into two equal lines and give the first person on each line two cardboard feet. Explain that this relay is part of the formal Power Ranger tryouts. The feet become the only thing the kids can step on as they travel from the front of the line, around the chair and back to the line again. The game begins when two players from each team place one foot on the ground and step on it. Then they place the other foot on the ground in front and step on it. Kids then pick up the first foot and place it on the ground in front of the other. When they get around the chair and back to the line they hand the two feet to the next player in line. The team that completes the relay course first is the winner. *Power Stone Search: Before the Power Ranger birthday party, paint several stones in bright colors. Hide the colorful “power stones” around the yard. At game time, hand out buckets, pails or bags to each guest, while explaining that to defeat the evil Orgs, the Power Rangers must collect as many magic stones as they can. *Human Knot: Have all the Power Rangers party guests assemble in a circle. Get each one to extend his or her right hand into the circle and grab the right hand of another party guest. Then they extend their left hand into the circle and grab the left hand of any party guest except the one whose right hand they are already holding. Explain that Evil Org has bound the Power Rangers’ hands together. They cannot come apart until the Rangers undo their human knot. Now see if the kids can undo the knot while still holding hands! *Evil Org Freeze Tag: Define the boundaries of a square shaped area. Elect a guest to start as Master Org by standing in the center. Have all the other kids line up at one end of the square area. On the command “Go,” Power Ranger birthday party guests try to run across to the other side of the play area as the Master Org tries to tag them. If tagged, the children become evil Orgs, and they must reach out and tag the other Rangers running by, while keeping one foot planted. The game continues until all the Rangers become Orgs. The last Ranger left in the game can be the new Master Org. *Power Rangers vs. Troobians: First, choose two or more players to be the Troobians, and everyone else is a Power Ranger. When the helper yells “Space Control Delta!” the Troobians try to catch the Power Rangers. Those caught must go to a designated area called “Gruumm’s Dungeon.” They must then stand perfectly still, with legs spread out, until freed by another Power Ranger. To be rescued, one of their Power Ranger friends needs to crawl between their legs. The game ends when everyone’s been caught or when it seems like a good time to switch players. *Alien Invasion: The aliens have landed on Earth and are taking over the minds of humans everywhere. The Power Rangers must seek them out and banish them. To start the game, a Power Ranger must be selected, then temporarily leave the room. While the Ranger is gone, a Secret Alien is chosen, and the rest of the children act as the Humans. Before the Ranger returns, the Secret Alien will “brainwash” the Humans and start making strange movements that must be subtly imitated by others. (It should be hard to figure out who the Secret Alien is.) The trick is for the Ranger to detect the Secret Alien by closely watching everyone using special monitoring powers. *Emperor Gruumm: In this game, the Power Rangers’ nemesis, Emperor Gruumm, has been blinded by laser beams, but is still seeking to destroy anything that’s good in the Universe. The player who’s been pointed at must respond, in an undetectable voice, “I’m Blue Ranger!” (or another Power Ranger). Emperor Gruumm gets 3 guesses to determine who that person really is. A correct guess means that players switch places, transfer the blindfold and continue the game. An incorrect guess means everyone starts again until Emperor Gruumm is right. *Balloon Relay Race: Blow up 2 balloons (plus some extra just in case), and decorate them with Power Ranger colors and stickers. Line up the Power Ranger birthday party guests into two teams. Place a balloon between the knees of the first child in each line. When you start the race, the first player in each line must turn to face the next person in line. The second child must grasp the balloon with his or her knees and turn to pass it on to the third person, and so on. If the balloon falls to the ground, the team must start over. The first team to pass their balloon through the line wins! 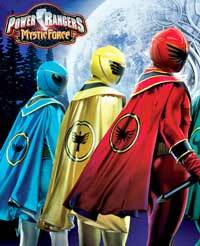 *Watch the Show: Invite everyone over to your TV set to watch video of one of the Power Ranger episodes. *Ninja Sword Cake: For this Power Ranger birthday party cake recipe, you’ll need white cake mix, 9×13″ cake pan, two 16-oz containers of ready-made frosting, blue and gold paste (or gel food coloring), a long cake board (about 45″ in length) covered with aluminum foil or red plastic table cover, black writing gel, and one small package of non-toxic yellow Crayola Model Magic. Place cake pieces end-to-end on a cake board. Trim one end to resemble a sharp point. Tint one container of the frosting blue for the blade end of the sword. Tint another container gold for the handle end of the sword. Use black writing gel to add decorative details and to write a birthday message along the blade of the sword. Using Model Magic, create a lip for the handle of the sword. *Power Rangers Cake: Bake a rectangular or round cake. Place Power Rangers cake toppers in the center of the cake for decoration. *Power Pizzas: Split English muffins and top with canned pizza sauce and shredded cheese. Place the muffin halves in front of the kids and let them decorate their own pizza. They may use pepperoni, mushrooms, olives and peppers to make faces. Bake on a cookie sheet at 375Ā° for 5-10 minutes, or until cheese melts. *Sweet & Crunchy Apples: Cut apples into 1/4″ thick slices (if possible, get apples in Power Ranger colors: red, green, yellow, and even pink apples if you can find them). Dip apple slices in a bowl of orange juice making sure to coat each side (this prevents the apples from browning). Shake off excess juice. In a small bowl, blend crunchy peanut butter and honey together. Spread half the slices with the peanut-butter-and-honey mixture. Top with the rest of the slices. Wrap with plastic wrap and keep chilled until ready to eat. *Krybot Krunch: For this Power Rangers party recipe, you’ll need 8 cups popped popcorn, 2 tbsp melted butter, 1/2 tsp cinnamon, 3 tbsp honey, 1 cup M&Ms; and 1 cup chopped nuts. Preheat oven to 300Ā°F. Spread popcorn on a cookie sheet. Combine honey, butter and cinnamon. Drizzle mixture over popcorn and stir until coated. Bake for 10 minutes and cool. Pour into a bowl and mix in M&Ms; and nuts. *Cold-Like-Mora Ice Cream Sandwiches: Roll out cookie dough and use star and moon cookie cutters (or butter knife) to create pairs of galactic shapes. Bake according to directions. When cool, carefully pile ice cream between 2 similar shaped cookies and serve. *Power Shake: Cut 2 ripe bananas in pieces and place them in a blender along with 3 cups of non-fat frozen yogurt and 1/2 cup of smooth low-sugar peanut butter. (You may have to half the ingredients if blender is too small.) Blend until smooth. Pour into glasses and serve. *Thirst Zapper: For this Power Ranger birthday party drink, you’ll need 16-oz jar of applesauce, 12-oz can of frozen orange juice (partially thawed) and 48 oz of water. Combine all ingredients in a blender and mix well. *Power Ranger Punch: You’ll need light-colored beverage (white grape juice or lemon lime soda) and food coloring (red, blue, green and yellow). Invite the kids to select their “power color”. Then have them add 2 drops of the corresponding food coloring to their cup of juice or soda. Fun and easy!